Give the Ecker Hill Park and Ride a shot. It may make your ski day even better. Those of you who follow the Park Rag know I can be skeptical of our bus system. I don’t think we, as a community, are people who embrace the bus. Yet, if the bus experience is better than a car, you may be tempted to try it. That is what I hope you’ll find when going skiing with the Ecker Hill Park & Ride and the 6 Lime Bus. Let me start by asking a question. If you live in Pinebrook, Summit Park, or Jeremy Ranch, how do you get to PCMR, Deer Valley, or Canyons? You probably get in your vehicle, drive to the resort, and hope there is parking. Then you circle the lot, park, unload your SUV, walk a mile in your boots, with your skis in hand, dragging your kids in tow, and finally get to the base of the resort. Let me present an alternative. Drive to the Ecker Hill Park and ride. Nobody goes there, so there is a ton of parking. Unload your vehicle in peace, and a couple of minutes later the 6 Lime bus will arrive. You’ll then be driven directly to the base of Canyons in lass than 15 minutes or to PCMR in 21 minutes. 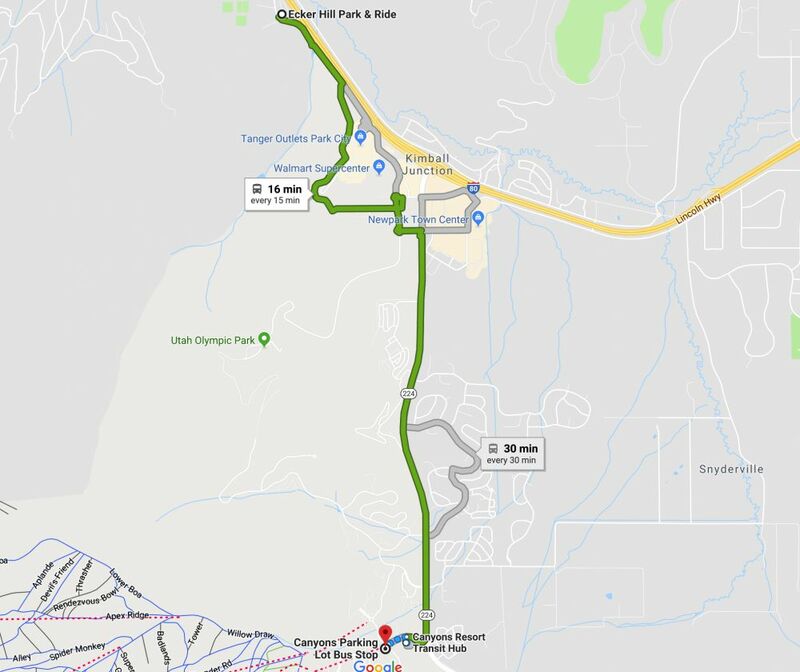 If you want to go directly to Deer Valley via the 6 Lime, get on the bus that leaves Ecker at 12 or 42 minutes after the hour. The 6 Lime becomes the 4 bus, which goes to Snow Park Lodge. You’ll be there in 35 minutes. Despite the resort you choose, you’ll walk about 2 minutes to the lift. You won’t have to stress over parking or lug your equipment a mile across a parking lot. Yes, you could drive to each resort in a little less time, but once you factor in parking, if you can find it (PCMR we are looking at you), it’s a wash and a lot less stressful to take the 6 Lime bus. If you are coming back from PCMR, catch the 6 Lime OUTBOUND. That will take you back to Ecker Hill. If you are coming back from Canyons, hop the 6 Lime OUTBOUND. That will take you back to Ecker Hill. If you are coming back from Deer Valley, look for any bus. Ask the driver if the bus is going to the Old Town Transit Center (95% of them are). From there, catch the 10 white to the Kimball Junction Transit Center. Then hop on the 6 Lime OUTBOUND to get back to Ecker Hill. It’s really pretty simple. Unfortunately, if you haven’t done it, it seems daunting. I think that’s why a lot of people don’t try it. I remember reading about the first few weeks of the 6 Lime bus service in the Park Record. They quoted ridership, and I realized my family represented 5% of the riders. My biggest fear is that not enough people will take the 6 Lime and they’ll cancel it. I personally love it. It’s so much better than driving. I can check email, read the news, and not personally over-pollute the environment. The next time you are headed to the resort, you may want to consider using the Ecker Park and Ride. The bus comes every 15 minutes. If you try it, I’d be willing to bet you’ll never go back to your car. It’s just that easy and carefree. That’s too bad. I don’t blame you. If the bus isn’t as easy as driving, people won’t use it. As I look at the bus data there are just so many runs with few people on them. I just don’t see how that is sustainable. I’d guess more people will be in your shoes once funding decreases and local government has to make tough choices. We love taking the bus to Canyons. It’s way faster than trying to find a parking spot and then hiking to the cabriolet. I live in Pinebrook and work holidays in the ticket office at Canyons Village, and I LOVE the Ecker Hill Park and Ride. I hop on at 6:57 a.m., disembark at the 7-11 by 7:10, where I fill my travel mug with tea, and then head up the Cabriolet and am always early for our 7:30 a.m. team meeting. Once the underpass is completed, it will also be a HUGE benefit to Ecker Hill students who take the city bus because they live too close for PCSD bussing. So much safer than having them dart across the busy road before or after school.